Pine forest densities have increased by a factor of ten since Clinton-era policies bowed to environmentalist demands that eliminated clear-cutting of forests. This leads to skeptics’ counter-arguments due to their fear of being played by those who use human-made global warming arguments as a means (e.g., big money taxation) to an end (power over sovereignties through global governance). Some basic facts. There is merit to both the human-made global warming and skeptics side of the debate. On the human-made global warming side, climate is clearly warming, but not much — only by 0.9 degree Centigrade (degC) (about 1.5 degrees Fahrenheit) over the last 140 years (see Fig. 1a). 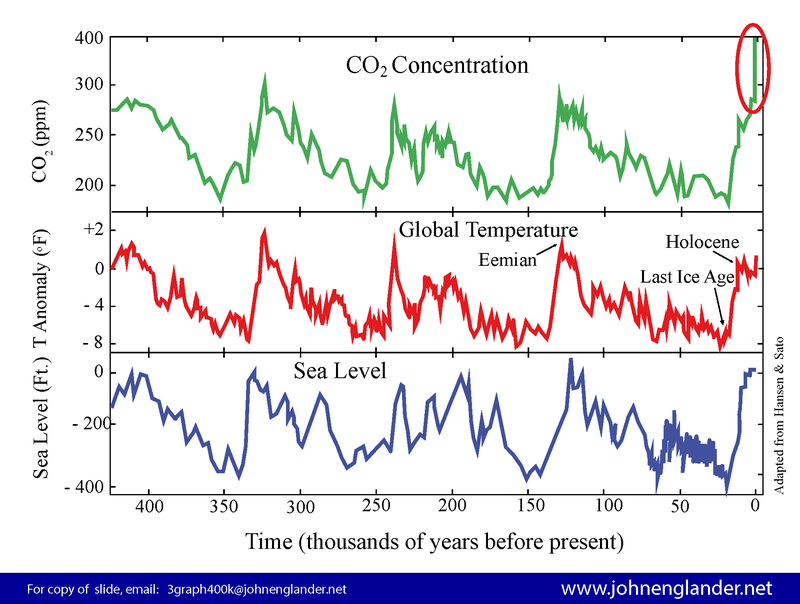 The figure also shows the CO2 concentration over the same time period and its remarkable correlation with temperature. But, during this time, sea-levels have risen only about 10 inches — really not as much as one might expect from such a small temperature rise. This undermines the alarmism of human-made global warming advocates and favors the skeptics. Actually, CO2 accounts for only 60% of the greenhouse gas effect. There are other key greenhouse gases: methane, nitrous oxide, and chlorofluorocarbons among them. 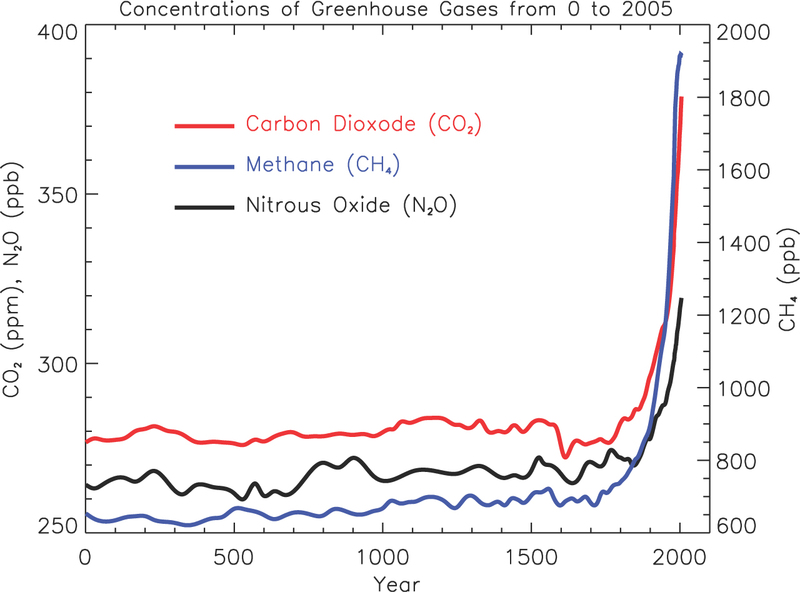 We can see in Fig.1b that methane and nitrous oxides are also rising dramatically upward along with change in CO2 levels. 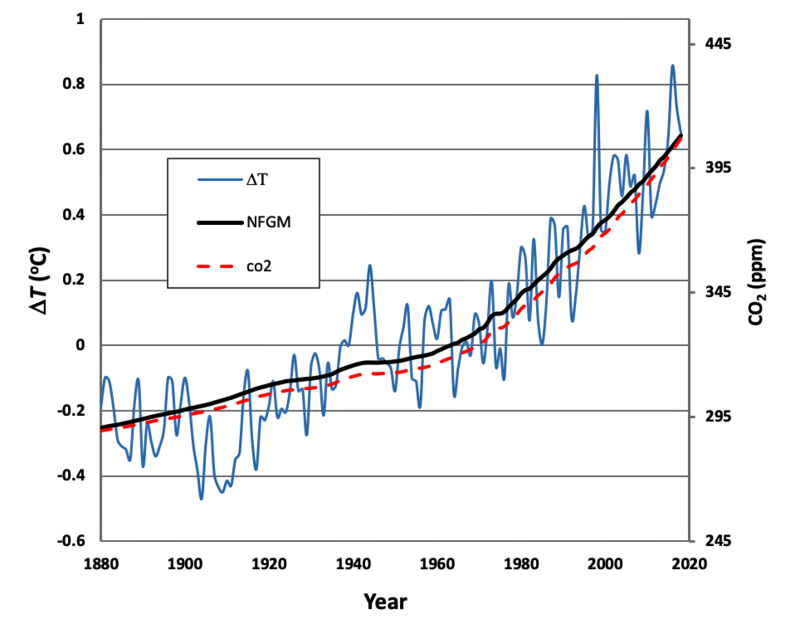 So, how do the temperature and greenhouse gas rise fit in with historical values? A picture is worth a thousand words (see Fig. 2). Temperatures, change in CO2 levels and sea levels have risen and fallen in 100-kyr cycles (1-kyr is 1,000 years) over the last half-million years. The cycles represent 20-kyr interglacial warm periods alternating with roughly 80-kyr ice ages. Temperatures have a range of about 8-10 degC change in CO2 levels, from lows of 180 parts-per-million (ppm) to highs from 280 to 310 ppm, and sea levels rise by about 100 meters from ice age to warming period. It is believed these 100-kyr cycles are due to an interplay of earth’s orbital dynamics (Milankovitch cycles) with drying and consequent vanishing of vegetation taking place at higher altitudes due to the low change in CO2 levels at cycle bottoms since change in CO2 levels is retained by colder oceans. This enables dust storms that dirty the ice sheets, increasing their absorption of sunlight, and causing melting. This mechanism drives to completion when ice sheets have retreated to places like Greenland and Antarctic enclaves, and cooling slowly resumes as the ice becomes increasingly pristine due to greater vegetation coverage at high altitudes in the higher change-in-CO2-levels environment, and the precession of the orbital axis begins to favor sunlight in the lower percentage land area of the southern hemisphere. This can be called an “albedo-dust-orbital” coupling mechanism. It drives warming of about 10 degC over 100 centuries from ice sheet maxima into interglacial warm eras. That is about 0.1 degC per century (degC/century). But we are currently warming at a rate more than ten times that — at about 1.5 degC/century (according to satellite data). A few tenths of a degC may be due to the upswing in the Atlantic Multi-decadal Oscillation (an ocean-atmosphere heat exchange mechanism), but most of it is something else. This definitely argues against the skeptic’s claims for natural mechanisms. Furthermore, from the mid-1700s, change in CO2 levels has taken off from 280 ppm to exponentially higher. We’ve just recently breached the 400 ppm level in the last few years; that is 120 ppm above the last interglacial peak — matching trough to peak changes in change in CO2 levels in the 100-kyr cycle. This rise in change in CO2 levels is clearly not part of a “natural cycle,” and again argues against the skeptics view. Also, such a rapid increase can’t be good for the environment. At the same time, while recent temperatures in Fig. 2 have not followed CO2’s meteoric rise, they are still rising at an unprecedented rate — three to ten times the maximum rates during 1-kyr cycles that gave rise to the Minoan, Roman and Medieval warm peaks of the last 3,300 years, and the respective cold periods that followed them including the little ice age that bottomed around 1700 AD from which we’ve been warming ever since. This again would argue against the “natural cycles” argument. Most scientists believe modern warming is due to greenhouse gas accumulation. The effect of increasing CO2 levels on climate has been a growing focus of research since the Nobel laureate in chemistry, Svante Arrhenius, proposed a model of global warming in 1896. While this belief may be a “trivial” one, as Richard Lindzen of MIT — a famously self-proclaimed “climate denier” — once said, million dollar global circulation models (GCM) run on supercomputers include greenhouse gas effects yet their predictions are falsified by temperature data. To wit, if CO2 levels are doubled, GCMs generate a temperature shift of 3.0±0.2 degC for a 100-run average, whereas only 1.6±0.3 degC is observed by satellite (the oft-quoted 1.5 degC uncertainty of GCMs in the Charney MIT report of 1979 is reduced when computed using a standard-error). On the other hand, the no-feedback greenhouse model calculation of Fig. 1a, presented at the summer conference of the World Institute for Science and Technology (WRIST) at Gifu, Japan, in 2018, is simply an extension of the Arrhenius formulation to include the main greenhouse gas components and can generate results using just an Excel spreadsheet (WRIST was founded in 1984 by Rev. Sun Myung Moon for the advancement of science and engineering for the benefit of humankind). It is therefore quite surprising that the no-feedback greenhouse model temperature prediction falls within about two percent of the best fit for Arrhenius-type forcing models. As such it should be considered superior to GCM models for the purpose of forecasts upon which policy recommendations are made. In light of that, it is difficult not to conclude that the current warming is due primarily to greenhouse gas warming. That is, the no-feedback greenhouse model clearly and unambiguously identifies the exponential greenhouse gas increase shown in Fig. 1b as the causal mechanism of a roughly exponential increase in temperature shown in Fig. 1a. Warming effects are currently subtle. To this point, effects of warming are observable, but remain small. Glaciers are receding or disappearing, there is decreasing Arctic sea ice, and some changes in local climates and growing seasons. Jet stream patterns in the northern hemisphere have become less “zonal” (east-west) and more meridional (north-south) due to warmer north polar temperatures which lowers the north-south temperature gradient that drives the jet stream. Weaker jet streams are in turn more vulnerable to creating more stationary regional “heat domes” or “cold sinks” that last longer, creating more serious health risks to populations. While there are claims that hurricanes and typhoons are more extreme, and ocean temperatures are higher to justify such claims, actual statistics on hurricane strength do not clearly show that — at least not yet. Most of the damage that hurricanes inflict are largely due to unwise districting (e.g., having below sea-level communities in New Orleans), including the buildup of densely populated coastal communities. Catastrophes such as caused by superstorm Sandy, and hurricanes Katrina or Michael, have been warned of for years by former National Hurricane Center directors, and well before the climate warming argument became fashionable. Sea levels have risen, but not even a foot over the last 200 years. Fantastic predictions of warming disasters have come and passed without realization. There are no “climate refugees” of coastal inundation. And wild claims have been an embarrassment for human-made global warming leaders. For example, in the mid-1980s, and before a congressional committee, James Hansen of NASA’s Goddard Institute for Space Studies apparently blundered into an awful prediction of a global temperature rise of 2 degC by 2010, yet it later turned out temperatures rose only about 0.3 degC during that period. How could scientists be so wrong? Maybe it was this very the lack of temperature change that drove leaders and researchers in the Hadley Climate Research Unit to apparently try and “adjust temperatures” in their datasets downward in the past to make it appear more warming was taking place, and to seemingly conspire to remove board members from peer review publications who weren’t sufficiently on board with the human-made global warming viewpoint (cf. “climate-gate emails”). This was alarmism and confirmation bias working against people who had been transformed from scientists into true believers. At least Hansen had the integrity to resign his post recently as a scientist and become a full-time human-made warming lobbyist and advocate. The fact is, warming in one direction will produce effects in the same direction, and if trends of greenhouse gas increase are not reversed, so will the trend in sea level rise. It takes a long time (centuries) to mix a given temperature increase down through an entire ocean column, and the ocean expands more and more as that mixing happens. Every 1 degC is believed to imply six feet of sea level rise over a millennium — half through thermal expansion, half through melting of land-based ice sheets and glaciers. That six feet takes centuries to develop, but it will happen — guaranteed. Remember, ocean levels have risen about 400 ft since rising from the depths of the last ice-age. Moreover, beyond a 1.5 degC rise in global temperature from the 1750s, it is believed by some that the Greenland ice sheet may become unstable to wholesale melting. While that melting may itself take many millennia, it will eventually cause an additional 20 foot sea level rise (at about an extra half-foot per century), which is not good. On the other hand, we are experiencing long-term cooling since the peak in the current Holocene interglacial maximum about 6,000 years ago. The series of descending 1-kyr cycle warming peaks — the Minoan, Roman and Medieval maxima — foretell a colder future and eventual descent into a new ice age. This would be truly catastrophic as it would physically destroy most of the northern cities of Europe and North America. At some point some controlled warming will be necessary to avoid this. Maybe the emission of CO2 by humans and knowledgeable stewardship of greenhouse gas concentration is a part of God’s plan. This is not normally a skeptic’s argument, but it is a reality. If the human-made global warming camp gets its way completely, we are in danger of more severe problems, jumping out of a warming frying pan into an ice age fire. What is to be done? If we do nothing, change in CO2 levels will continue as burning fossil fuel is cheap. And continuing that will slowly and inevitably create problems. Increasing change in CO2 levels in the oceans is causing acidification, which is impacting shellfish offshore of the western U.S. But, more significantly, we are currently in the midst of a great dying of species — as fast or faster than the great dying of the Permian era where 90% of existing species vanished. In the last two to three decades, insect biomass has decreased by 75% in many regions of industrialized countries. Some argue that climate change is responsible, but I doubt it. I suspect it is due to chemical pollution and the driving out of species from the physical expansion of civilization. If there is alarm in any current environmental message, this is more likely it. Regardless, change in CO2 levels and other greenhouse gas increases should be controlled. The most straightforward way may be re-forestation and other greening efforts (e.g., greening of cities including roof-tops, streets, parking lots) as vegetation not only cools through evaporation, but directly absorbs CO2, returning O2, and absorbs less radiation than concrete and asphalt. This could help offset asphalt heat traps our cities have become that give rise to the “heat-island” effect that has now blurred into “heat-regions.” And oddly, agriculture — which seems like a “green business” — produces 25% of all greenhouse gases (methane from cattle, nitrous oxide from fertilizers). Controlling that will be a challenge. As per the skeptics argument, simply ridding the world of cheap coal penalizes underdeveloped countries striving for prosperity. But, there can be concerted efforts of industrial countries to install increasingly cheaper solar power in third world countries. That involves sacrifice of the richer on behalf of the poorer nations. And isn’t that a principled approach? Transportation fuels have to re-examined (e.g., using potential fuel cell or existing electric technologies). And electric is not so green if it depends on fossil-fuel power generation; so any advocacy against greenhouse gas emissions that does not include advocacy for new nuclear technologies smacks of hypocrisy and political manipulation. Modern modular passive-cooling nuclear reactor design allows regulation to be fast-tracked as the era of one-off melt-able nuclear fission plant design comes to an end. And recent advances in high-temperature superconductivity offer the hope that magnetically-confined fusion can finally realize its promise within 10-20 years. If we are to tax carbon use, it must not be simply to enable aggrandizement of power in the hands of global governing authorities and banks. It should be used to help transform fossil fuel-based electrical production and transportation into green alternatives. That takes discipline. And any taxation or restricting solutions must be global. It must not be done only by California, or the U.S., or the U.S. plus Europe. It must be done with the collaboration of the most rapidly advancing economies: India and China. And it needs to be done quickly. Using the no-feedback greenhouse model and “business as usual” rates of greenhouse gas production, the IPCC and Paris target climate levels of 1.5 degC and 2.0 degC will be breached in 2070 and 2110, respectively. It doesn’t help the human-made global warming argument when the GCM results they typically depend on are falsified by temperature data. And evidence persists of confirmation bias in temperature “adjustments” made by NASA data stewards that seem always to “cool the past,” thereby generating higher rates of warming today. These issues continue to cloud the debate, causing many political conservatives and climate skeptics to remain unconvinced that something can and should be done. 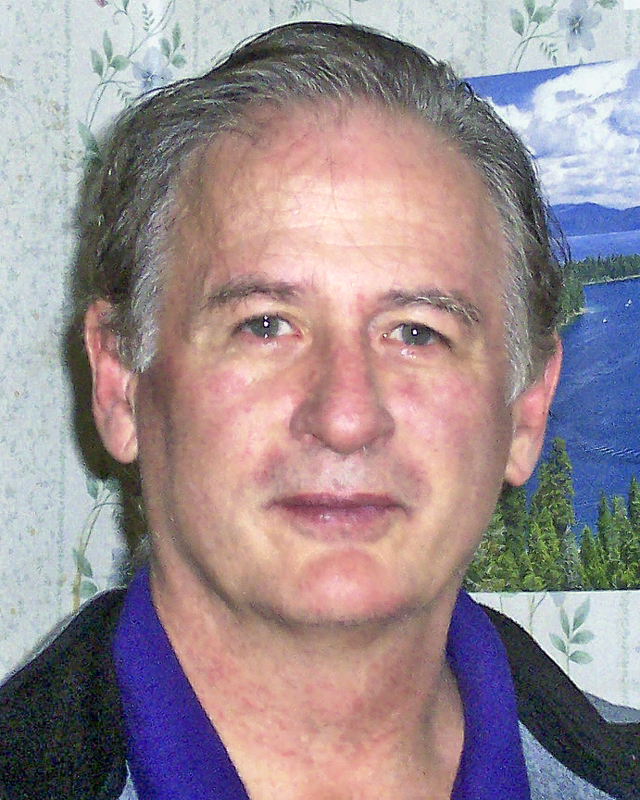 Dr. J. Andrew Combs earned his Ph.D. in Applied Radiation Physics in Nuclear Engineering at MIT in 1982. Currently, he is President of the World Research Institute for Science and Technology (WRIST), founded by Rev. Moon, and is an instructor of physics and astronomy at Las Positas College, Diablo Valley College and Laney College in California. Climate change is real and comes in cycles, just like the weather does. Ten thousand years ago there was a “Little Ice Age,” which lasted briefly by geological standards, and then it ended like all changes do and the planet bounced back. The Sahara Desert was once a lush area of the world and now it is most arid and forbidding. Erosion on the Sphinx at Giza was caused by water, not wind, which means the Sphinx is much older than the Great Pyramid and tells of a time when Ancient Egypt was lush and green. North America was once dominated by a great inland sea; mountain ranges rise and fall; whole continents drift; fires, volcanoes, hurricanes, typhoons, tsunamis, and earthquakes shake up the ecosystem, yet the planet invariably bounces back. Humankind is more aware than ever of climate change since we live in a scientifically driven age when everything is under the microscope. Al Gore, of “An Inconvenient Truth” fame, said 10 years ago that in “five years” there would be no more North Polar ice and now there is more ice than ever up there. You haven’t heard much recently about polar bears dying due to a lack of ice, have you? We used to hear about it seemingly every day. Yes, so-called “Climate Change” is real, just like all things change in the natural world. As to how fast such change will occur in the near future, who knows? Al Gore doesn’t, and he won a Nobel Prize for his “breakthrough studies.” The polar bears seem safe for now and Miami and Manhattan are still not underwater. Only when a new energy source replaces fossil fuels will we know for sure if humankind contributes to climate change. But that wholesale technological transformation occurs and the climate still continues to change, whatever shall we do? Occupy other planets? Probably not. Most likely we will just make do with whatever we have here like we have always done. Reading your article is like a breath of fresh air. This is the type of analysis that is needed and missing from both political debates and the media. I am glad to see it here on the Applied Unificationism Blog. Other data could be added to the discussion of global warming. While there is no doubt a correlation of man-made greenhouse gases and climate change, there are indications that solar activity and other factors have, in the past, overwhelmed the impact of greenhouse gases. In other words, we can go back in time and find periods where CO2 was much higher and temperatures were not rising. We can find periods where a greater greenhouse effect, in some places like the Sahara or Gobi deserts, created lush green landscapes in which many species of wildlife thrived and were perhaps driven to extinction by global cooling and reduced CO2. We also know that there are many ancient cities buried under the ocean about 100 feet deep due to the rise of the oceans and the melting of major glaciers around 10,600 BC, and that the human race survived by resettling in new areas. Climate change can be influenced by human beings but not controlled by it. Also, in the larger interest of “saving the earth,” it might be argued that dumping plastics in the oceans poses an equal or more serious threat to wildlife than greenhouse gases. It is killing ocean birds, fish and whales. When we think about living in harmony with the earth, we must recognize that other larger factors, like where there is a magnetic field, are beyond our control (there was a magnetic field on Mars at one point that does not exist today because it does not have the same kind of molten core as the earth). Thus, we need to find our place in the universe and learn to live comfortably with it — knowing what we can control and what we cannot. One thing for sure is that people who seek power and wealth will find ways to scare people into creating large centralized economic funds they (the elites) can control in the name of staving off a catastrophe. Since both greenhouse gas increases and plastics pollution are the byproduct of human activity of billions of people, it would be more prudent to devise ways these billions of people could live just as happily. Self-sustaining homes or communities decoupled from large electrical grids, employing solar and geothermal power driving less-power-consuming equipment, might have a better effect than a global carbon tax that allows large corporations to buy a ticket to pollute. We could apply some technologies designed for long-term habitation in space, where resources are very limited, to family homes on earth. We should think of ways that individuals, families, and communities can better control their own destinies without making a negative impact on other people or the environment, and to what extent living “off the grid” makes some sense. The byproducts of billions of people living in self-sufficient, self-recycling, habitats might be better than the type of centralized control and planning that utterly failed in the Soviet Union. We also would benefit from more knowledge of the natural cycles that we cannot control and how to live harmoniously with them. The Dutch example of claiming land from the sea represents a certain amount that humans can do to alter a natural environment. Does such activity as reclaiming land from the sea pose more or less a threat to the larger world than burning fossil fuels? In the end, we are caretakers of the earth, a very complex ecosystem, and should live in harmony with it. One could argue that doing nothing — like not keeping the forests in California safe from fire — might be a dangerous as doing too much — like burning lots of fossil fuels at the base of the Los Angeles Mountains where pollution concentrates due to natural weather patterns. It is time to talk about doing the responsible things and not using the shallow political rhetoric Andrew describes to either manipulate the law to get rich or destroy people’s lives in the name of saving the environment. Yes, we need ways that encourage billions of people willing to participate in cleaning up and acting as stewards toward the environment. I would like to see a technology effort along the lines of the space program to develop all kinds of appropriate solutions, including technology for average folks, not just in the U.S. but worldwide. This money would go farther, I believe, than carbon credits. I agree. The “plastic” problem in the ecosystem is really a huge and under-reported issue. It will take a major effort — starting with greater awareness — to remedy this growing threat to the natural world. One significant take-away from Andy Combs’s well-researched article is that our current cycle of increasing CO2 concentrations in the atmosphere are 25-40% higher than they have ever been for hundreds of thousands of years [see his third paragraph]! This unprecedented spike in CO2 is certainly a result of modern human activity, and if this trend continues it will have a significantly deleterious impact on our global environment in the future. We need to take steps in line with TM’s advice. Thanks for an excellent article searching for the truth between the two extreme camps. As I’ve argued elsewhere (Denis Collins and Chunfang Zheng, “Managing the Poverty-CO2 Reductions Paradox: The Case of China and the EU,” Organization & Environment, 28(4), 355-373, 2015), the root of our climate change problem is eradicating poverty through CO2-based industrialization. We don’t want folks who are our brothers and sisters, starving to death (i.e., China prior to 1990). Unfortunately, the quickest way out of poverty is CO2-based industrialization (China and India post-1990), which shoots ourselves in the foot. We need renewable energy industrialization, or post-industrialization, not CO2-based industrialization. I’ve always found it interesting that right-wing conservatives take that Industrial Revolution pivot personally. They shouldn’t because Russia and other non-capitalists nations have industrialized without capitalism and they are really making things worse. 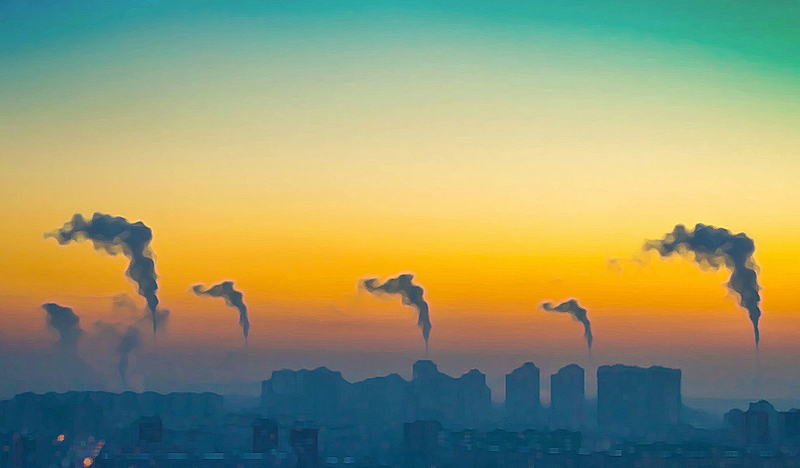 The problem is CO2-based industrialization, not the economic system. Andrew’s primary argument against the extremists is that…well, they are extreme. A group of them seems to enjoy exaggerating worst-case scenarios and assume that they are true, which damages their credibility. Nonetheless, unlike the deniers, the extremists are basically accurate about the primary cause of climate change. The question remains: how rapidly will the projected negative consequences occur. Andrew is saying not as rapidly as the extremists say. However, he also ends with “And it (carbon tax) must be done quickly.” So he sounds a bit in a hurry too, and I agree we should be in a bit of a hurry on this matter. President Trump is not going in Andrew’s direction, though he can pivot on a dime and say he really didn’t mean what he said about climate change nor did he mean to reinvigorate coal mining at the expense of renewable. That man is a character. The only part of Andrew’s analysis that made me cringe was toward the end: “Maybe the emission of CO2 by humans and knowledgeable stewardship of greenhouse gas concentration is a part of God’s plan.” Ugh. And the negative side effects of chemo I’m dealing with right now may also be part of God’s plan? Thanks! I don’t blame the industrialists in the 1800s who were doing the best they could with the resources available. I just blame modern-day Republicans who have fueled and fed off the climate change deniers, and the Democrats for not pulling in the extremists and then taking more moderate action 30 years ago. But then former Bush 41 chief of staff John Sununu got in the way (that’s in this fascinating New York Times Sunday Magazine article from August). 1. The insurance industry, which relies upon its ability to predict, using probabilities, the costs of disasters from floods, sea level rise events, fires, and other events, is already changing its calculations to factor in climate change. See this article for more details. 2. Where we live matters more now: roughly 40% (3 billion) of the world’s population lives within 37 miles of an ocean. And 123 million people in the U.S. live in counties that border an ocean. All of these people face an increasing risk of flooding, catastrophic in growing instances, in part due to sea level rises, increased intensity of storms, old storm water and sewer systems, and land use in drainage systems (more paved surfaces) that all increase these risks. And people are living in more risky areas subject to fire and mudslides. See “Wildland Urban Interface” to learn about this. 3. Access to clean water is a vital metric. Lost in the debate about how much the world’s temperature comes from natural vs. human causes is the everyday need for access to clean, potable water. Las Vegas and Phoenix depend upon the runoff from the Colorado River almost exclusively, which is not expanding. Los Angeles depends on water from Northern California as does the Central Valley which produces much of the food we eat every day. Most cities in the world face similar problems. 4. I would prefer the U.S. and other countries develop a technology initiative along the lines of what the U.S. military did with DARPA and the space programs to develop solutions to cleaner energy sources rather than simply proposing carbon credits and transfers of money. We need transfers of applied technology. Perhaps carbon credits can play a role. There is a lot more to discuss, but I’ll stop here [however, Mr. Sayre’s follow-up article on climate change will appear here on Monday, Dec. 24 — ed.]. If you look at the riots in France over increasing the gas tax for climate change, this is, in a nutshell the problem with only global metrics. In Pennsylvania where I live, the gas tax was increased $.09/gallon/year for three years to repair bridges and roads. Some people complained, but the roads and bridges are being rebuilt without waiting for the federal government to get off the mark. I am 100% okay with this tax, as are most people. Interesting article and important area. You try to be objective and want to go back to science, but unfortunately your politics breaks through, and this combined with trying to promote your “no-feedback greenhouse model,” the overall article ends up being the opposite of that. Contrary to what you seem to imply, there is valid climate science outside of the politicization. It is a shame you are so dismissive of it. I wish you had said more about your model. Is this something you have constructed, or are you just reporting on it? How does the Arrhenius model explain warming? Arrhenius was long before the mechanism for how carbon dioxide contributes to warming was understood, so how can it apply? You did not sell me that a one variable calculation (carbon dioxide concentration only) without feedback has any hope of providing a better explanation/prediction than one that takes into account multiple variables and feedback. Your comparison between the two doesn’t ring true somehow. Modern modelling techniques have greatly improved as increasing computing power allows more factors and greater resolution to be added to the simulation. It is precisely because of the level of complexity of the problem that there is as yet no completely definitive answer to the extent of human contribution to warming. The best we can do is to say that it is perhaps 95% likely. In my book this is likely enough to act on. How can a too simple model help outline a course of action? At the last ICUS, there was a suggestion that at around a 1.5C increase in temperature, positive feedback loops, from such things as reduced albedo due to loss of sea ice and the release of methane from melting permafrost, would overtake human forcing of the climate changes. Our window of being able to effect a change is perhaps closing. The word may become “resilience” rather than “sustainable.” We are already passed planetary boundaries on some issues and are approaching, if not already passed, another in climate change. Yes, planetary boundaries need to be brought up and discussed more. Metrics need to be developed for these, not just average temperatures.